Free For All received a sample to facilitate this post all opinions are 100 percent my own and no financial compensation was received! I am a huge fan of sweet tea here we make what is called sun tea. To make sun tea you set your pitcher outside covered or in a windowsill where there will be heat on a hot day and let the tea bags steep. After one really hot day or two mildly warm days your tea is ready and in my opinion is the tastiest tea in the world. We were give the opportunity to try Southern Breeze Sweet Tea they sent us an amazing set (pictured below the pitcher was not included). Southern Breeze has a strong tea favor and it takes very few bags so you get a lot for your money. This whole pitcher took only 2 bags. I always add sugar to mine and I was wowed by the taste it is most definitely the Southern tea I grew accustomed to as a childhood it brought back great memories for me with my grandma. My grandmother introduced me to the world of tea. I would recommend Southern Breeze Sweet Tea to any tea lover. You will not be dissatisfied it is one of the best teas out there! It comes in Original, Raspberry, Peach and Lemon so there is a flavor sure to please everyone! 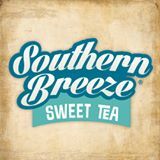 Southern Breeze Sweet Tea is giving you so many chances right now to try samples free and get coupons so take advantage. But first you will need to know who carries Southern Breeze Sweet Tea use their store locator here to find out! Enter here http://woobox.com/mxdnp8 and you have a great chance of winning a sample! We loved our Southern Breeze Sweet Tea and are sure you will to make sure you are following Southern Breeze on Social Media below to stay up to date on all of these contests, coupons, giveaways and events you can see they are often as all of the ones I shared are going on now. 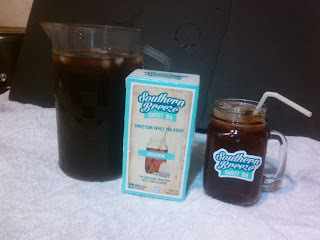 But wait that's not all Southern Breeze wants to give one lucky fan a Southern Breeze set than includes Mason Jar with straw and full size box of Original Sweet Tea check out our giveaway post here.